Late fall in Minnesota is a beautiful time. The leaves are turning vibrant colors, the summer humidity has finally gone away, and the temperature is just right for cozying up to a fire. However, some don’t enjoy the reminder of winter coming soon while they’re trying to enjoy their backyard. 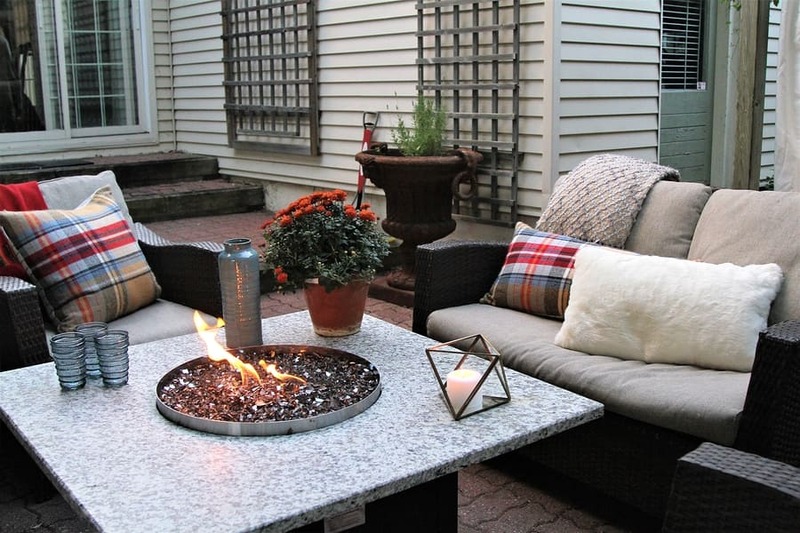 With the right design, you don’t have to be scared away from your outdoor space by the upcoming winter. First of all, setting up your outdoor living space on a paver patio makes it easy to clean off all those fallen leaves with a quick sweep. A pergola or other coverage, however, will solve that issue instantly. If you already have an outdoor kitchen or bar area, then you’ve got the perfect excuse to grill up some food or warm drinks before settling in for a family or friend’s night. Filling your storage containers with blankets, pillows, and other necessities makes it easy to relax on your cushioned furniture. To really perfect that cozy atmosphere, stringing lights around the space will offset the shorter days. While talking around a fire pit or fire table is enough for some hosts, others will want more to keep them entertained. Installing a TV or stereo system makes it the ideal hangout for family fun night. Give us a call to learn more about how your backyard can be transformed into the perfect year-round living area.